Josephine Ensign was born in Richmond, Virginia in 1960. She received her BA (Biology and Religion) from Oberlin College in 1981, her masters in primary care nursing from the Medical College of Virginia in 1986, and her doctorate in public health from the Johns Hopkins University in 1996. She has done postgraduate work in medical ethics at Harvard University and in narrative medicine at Columbia University. She is Professor of Community Health at the University of Washington (UW) School of Nursing in Seattle, Washington where she teaches health policy, narrative medicine, and health humanities. She is also Adjunct Professor, UW School of Arts and Sciences, Department of Gender, Women and Sexuality Studies; and Affiliate Faculty, UW Simpson Center for the Humanities Certificate Program in Public Scholarship. Ensign is Director of the University of Washington Doorway Project, an innovative Washington State-funded community-campus partnership program addressing youth homelessness in Seattle. Ensign has worked as a family nurse practitioner for the past three decades, providing primary health care to homeless adolescents and adults in large urban areas on both coasts of the U.S. Through a Fulbright Fellowship, she expanded her research and advocacy internationally with work in Thailand, Venezuela, New Zealand, Scotland and England. The focus of her career has been to increase an understanding of the lives of marginalized populations, and to develop ways to increase their access to effective health care programs. As a university professor she has published numerous journal articles and book chapters on homelessness, health and human rights. Her literary non-fiction essays have appeared in the The Sun, Oberlin Alumni Magazine, Silk Road, University of Iowa’s Examined Life, and Johns Hopkins Public Health Magazine, Pulse :Voices from the Heart of Medicine magazine, The Intima: A Journal of Narrative Medicine, and The Front Porch Journal. An essay “Next of Kin” is included in Creative Nonfiction’s anthology I Wasn’t Strong Like This When I Started Out: True Stories of Becoming a Nurse (Lee Gutkind editor; In Fact Press, 2013). She received a Hedgebrook writing residency in 2014. Ensign’s medical memoir, Catching Homelessness: A Nurse’s Story of Falling Through the Safety Net, was published by She Writes Press in August, 2016. It was the University of Washington’s Health Sciences Common Book for academic year 2016/17. It was named the American Journal of Nursing 2017 Book of the Year for creative works for a general audience. 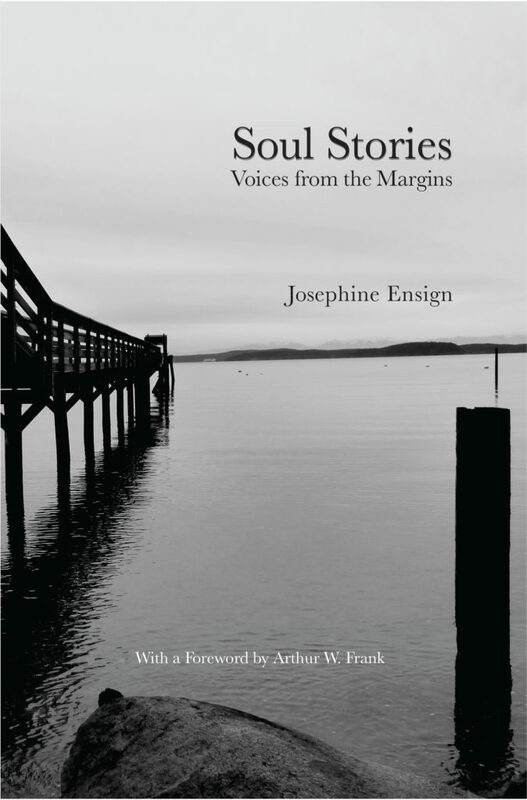 Her second creative nonfiction book, Soul Stories: Voices from the Margins was published July, 2018 by the University of California Medical Humanities Press. It was named the American Journal of Nursing 2018 second place Book of the Year. Ensign is currently at work on an additional book/public scholarship project, Skid Road: The Intersection of Health and Homelessness. Through my writing and photography I engage in critiques of current social justice issues such as poverty and homelessness, trauma and resilience, and the wellbeing of marginalized populations. As a nurse and academic with the lived experience of homelessness, my writing and photography are ways to explore possible answers to complex ethical and existential questions. My aim is to humanize health care, to cultivate empathy leading to action. For the past decade my work has centered on using personal stories to highlight important public policy issues within an emancipatory framework. My writing has moved from traditional narrative nonfiction essays, to include more open form essays, as well as poetry. Extending my cross-disciplinary approaches in new yet complementary directions, I create mixed-media collage and bricolage artwork using my photographs, bits of writings, and various found objects. These often help me work through issues that are difficult to translate into words. I resonate with this statement by Joanna Russ: “Minority art, vernacular art, is marginal art. Only on the margins does growth occur.” I enjoy working—and living—on the margins. I blog as if my late mother were reading every word I write. If you knew my mother, you would understand that this is a much higher ethical code than any existing blogger’s code of ethics. The views expressed on my blog are my own, and do not represent those of my employer, the University of Washington. All materials on this website are copyrighted and can only be used with proper attribution. I appreciate e-mail from readers and respond to all (appropriate, that is) comments and questions. I took your homeless youth class several years ago while I was in nursing school. I am starting the Community Health Nursing program at UW this fall. I stumbled upon your blog through someone who posted it on Facebook. I can’t wait to read more. I have always admired and respected what you do. Thanks for the note and update on what you are up to now–congratulations and lucky us to have you starting in community health! Hope to see you around. My name is Sam and I work with Jacksonville University’s School of Nursing. Because of the quality information you are providing to the online world about nursing, we would like to award your blog one of the “20 Best Blogs for Nurses.” To mark this achievement, I am including code information with this email. When the code is added to your blog, a badge will be produced which announces that Jacksonville University considers your blog one of the 20 Best Blogs for Nurses. You can see what the badge looks like here: http://schoolofnursingonline.wordpress.com/ on the right hand side toward the bottom. I wish to congratulate you on your success, and am happy to offer you help in successfully publishing this badge to your site. In the right hand column, you will be able to add this code and on every page your visitors come to, they will see that you have been recognized as a top blog in the niche of nursing. Please email or call me if you have any questions. Keep up the great work, and I look forward to reading future posts on your blog. When Is It OK to Write About Patients?